Two piece mask designed so that when you move your mouth, the mouth of the mask moves with it. One size fits most using elastic straps. 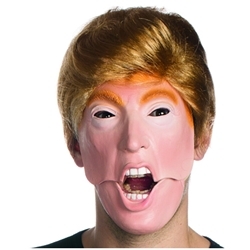 Perfect for creating the look of the billionaire who also happens to be the Republican nomination for President of the United States in 2016. Includes only the mask, wig sold separately.